Córdoba: The First City of Religious Acceptance and you didn't even know it, did you? From a state of vagabondery—sleeping on couches, sleeping bagged-nights, working for daily rations, and hardly knowing where our next stop would be—we were swept up by angels into a life that resembled what I seem to recall real vacations are supposed to be like. Prearranged train tickets, hotel rooms, reserved dinners...that was life for a short while. 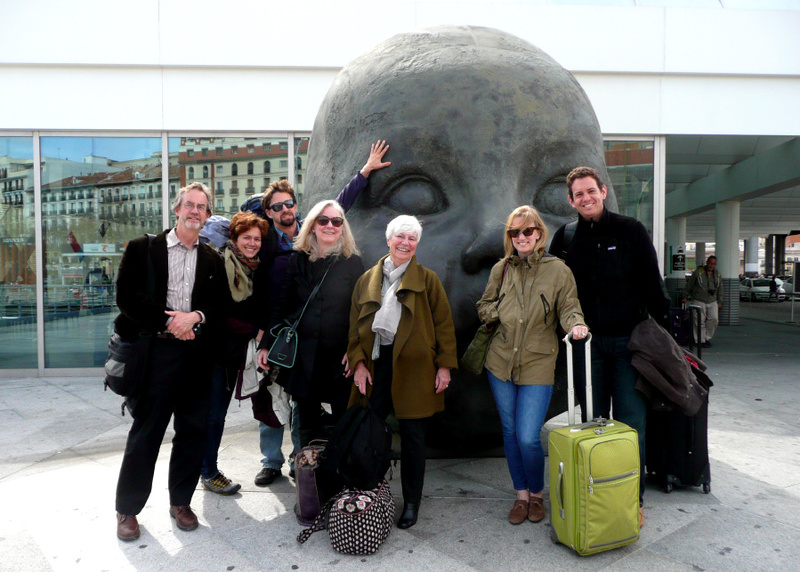 Something about seeing this huge baby head in Madrid let us know that it was time to take a group picture...John's dad, mom, grandma, sister, and brother-in-law, hoorah! As I sit here on a bed in Madrid in a tiny room with dimensions, literally, of about 7x7, I look at John and wonder if it was all a dream. Most people assume that this trip we embarked on nearly a year ago has all been a big vacation, and I can't deny that it's certainly been easier than a nine-five in an office, but moving around every couple of weeks can be exhausting in its own right. Rootless and filled with uncertainty. I see (but barely) how a "real" job has its merits. And so in came the Amorys with their boundless reserve of generosity, lifting John and me into a world where things were planned, life was consistent, and ah, living was easy. Whirlwind that it was, I found myself "off-duty" much of the time, just soaking things in, letting them float through me as I was lead through some of Southern Spain's most beautiful towns. Our last southern Spanish sojourn, after lively Granada and austere Ronda, was Córdoba, a town—the locals will explain—that is the birthplace of harmony between three of the world's major religions: Christianity, Judaism and Islam. Considering that Córdoba has probably been off the radar for most of you, you'll be surprised the learn that in the 10th century, it was the most populous city in the world, and not only that, it was one of the biggest intellectual hubs of its time. Geographically impressive is the additional fact that the city was under Islamic rule at the time, a sovereign that was notably tolerant toward the local Jews and Christians. The evidence is everywhere, from the still-intact Jewish quarter, to the huge mosque in the middle of town, and then to the adjacent Fortress of the Catholic Kings. Now for a history lesson: The mosque I just mentioned is kind of a big deal. Although the building was begun in 600 AD as a Christian church, it was purchased by an Islamic prince in 784 AD and then underwent about 200 years of construction to reach completion as a mosque. An architectural marvel in its own right, it gains further renown because when the Christians decided to usurp Muslim power in 1236 during King Ferdinand's efforts at that tireless Reconquista, rather than tear down the mosque, they simply decided to build a cathedral directly within it. Why waste a good foundation? And while we love to view the dual-construction these days in the more subtle light of "mutual religious respect," it's really just a phenomenally beautiful and inspiring relic of Christian oppression (but hey history, what's new?). Viewing the Catholic altar through the surrounding Islamic architecture. That cherub wants nothingto do with the grinning lion. What's he doing in a church anyway? The thing is, I could fill this post up with pictures, but for the sake of minimized uploading, let's just head over the the Chowgypsy Facebook Album, shall we? In a few days we're headed to La Catedral de Justo just outside of Madrid to do some volunteer construction work and get some fresh air away from the city, stay tuned! We arrived to Ronda after bittersweet goodbyes with the tapas world of Granada and one of the best dinners I've ever had. Ronda hasn't learned how to socialize very well with others. Nobody thinks to go to Ronda, do they? Let's take a moment to reconsider. Ta-Da! A view of Puente Nuevo looking up toward the edge of the city. Apparently the small enclosed area that you can see at the top center of the bridge was used as a prison during war time. Slightly intimidating? Driving through with veiled eyes, one might mistake Ronda for a town like any other: cute restaurants, a small village with tourist shops, cured pork legs abounding in all shop windows (honestly, even gas stations have whole cured pork legs on display in Spain). Looking at Puente Viejo ,the bridge that preceded the one on which we stood, and now looked forlornly on at all the lost foot traffic that forsake it for the new guy. John and I thought we could find wild asparagus, so we took an absurdly long hike in its pursuit, but got a nice view of the city from afar in the process. Not only could you pass through the town without realizing why it's so special, you could even pass right over the thing that makes it so amazing and, if you were looking down at your smart phone, you still might miss it. Overlooking the Guadalevín river that cuts through the city and made things a bit difficult until some aggressive bridge building took place. Hey, sometimes you just gotta build a bridge, amiright? Ronda sits in its quaint, self-contained manner high at the top of a winding mountain pass. It's isolated, and the people there know it. And so, with the trademark determination (willfullness?) of the Spanish people, they built a bridge so that they could have access from the outside, but keep others out, when necessary, once on the inside. So well was the city protected that at one point, its only weak point was a secret passageway from the river below that cut through the river's sheer mountainside border (read more about that below) and up into the city. Toward the bottom left are the beautiful pools at the base from which old Kings would make slaves carry up water. The most-renowned Ronda bridge, Puente Nuevo, dates back to 1751, when it underwent construction after King Felip V decided a new and better bridge needed to exist to one-up the two that had come before it. One-up it did, but not until after 40 years of construction and about 50 deaths in the meantime. At about 320 feet tall, it means business. To the bottom right are the ruins of Arabs baths near Puente Viejo and what once was the Moorish bridge. You can see the equestrian center sitting in the background, which isn't known for its ancient history, but we like horses, right?. The fact that Ronda is filled with Spain's oldest bullfighting ring, many amazing restaurants, and adorable cobblestoned walks is all background music. This bridge is it. You can come here five times a day and never tire. Through the old garden of the Moorish King one can find a set of secret stairs that lead under and through the rock wall the the bottom. Isn't history exciting and full of secret things!? Exiting this ancient door, you end up on a platform above a calm section of river, the area where Christian slaves came down to fetch water for the Moorish King (also the weak point through which Ronda was invaded). But do you want to know what else? I guess what I'm saying here is this: you should probably go to Ronda. Follow in your inbox to find out about our next stop in Córdoba! La Oliva in Granada. A Life-Changing Restaurant Review. Every once in awhile, you will have a food experience that is not just a food experience. It is more than that because it lingers long after it’s over. It is more because while it happens, you wonder if it's real. It is more because it creates a small world in and of itself. It grabs your teeth and pulls you into a land where every bite matters and every taste sparks mind more than mouth. By day, Granada's La Oliva is a corner store hawking high-quality foods and culinary gadgets. By night, the Cordobesan owner and chef Francisco closes the shutters, unearths a two-burner stove, and transforms the space into an intimate, two-table sanctuary of food exaltation. Retail jars of local confituras, glistening packages of panforte, and bottles of slim sherry vinegars hover in the shadows around you. This is the setting for your food experience unforgettable. We were seven—two-thirds of the available seating—and with a reservation made only a week in advance, we were lucky to get in. A small group scoots into the table beside ours, and once we're all settled, Francisco closes and locks shop to ensure no disturbances will mar this night of gustatory bliss. The EVOOs included Arbequina , Piqual, and a blend of Piqual, Picado, and Hojiblanco olives. They ranged accordingly in flavor from sweet and mild to strong and biting. Our dear Francisco going over the sherry prospects with John's dad. As the dinners are kept small, Francisco is able to stay in close contact with everybody and explain or answer questions whenever desired. There will be twelve to twenty courses—he improvises according to the night's progression. there will be free-flowing, carefully-paired wine and sherry. You will know what you are eating, and why. And don't fill up on the bread. With a clean palate (for surely you have avoided coffee and eaten mild foods all day? ), you are now ready for your experience at La Oliva. After Francisco's introduction, we received three small bowls of Spanish extra virgin olive oil. Tasting from mildest to strongest, one realizes there's a reason Spain produces over 50% of the world's olive oil supply. When it comes to that pure olive juice, Spain knows what it's doing. A Manzanilla fino sherry called La Jaca from Andalucia followed the olive oil, a smooth and mildly sweet liquor that is aged like a high-quality balsamic, where a bit of the last batch is always left in the aging barrel so that when each new batch is added, its flavor and composition is influenced by its predecessors. For our fifth tasting pleasure, we received four culinary spreads atop olive oil crackers called regañás. The assortment consisted of partridge pate, cream cheese with porcini mushrooms, sundried tomato with herbs and EVOO, and cream of Iberian ham. Next up was an Aspencat spread made of red pepper, onion, garlic, capellanes (salted blue herring), green pepper, and olive oil served simply with potato chips. (Sometimes the best route is also the easiest). A light dish of small quartered tomatoes bathed in fresh basil-infused EVOO then pleasantly interrupted the meal, just in time to trick us into thinking we were being healthy before a plate full of cured Iberian meats came out. In the selection was thinly-sliced Jamón , salchichón Iberico , lomo Serrano , and chorizo . This was the plate that will ruin me for all cured meats that I find in the future. Happysad. The light tomato basil salad flanked by perfectly thin slices of Iberian meat. Keeping the meat train running, our ninth dish was fresh Iberian chorizo sausage boiled in Manzanilla wine and served in a sauce of EVOO and the meat's juices. Flagrant and liberal dipping is a necessity here. My own tastebuds tell me that number ten was perhaps the best dish of the night...Consider whether you would ever think to put orange, radish, black olives, spring onion, and salted cod together in one bite, garnished with a bit of paprika and EVOO. You wouldn't dare? Meet Remojón Granadino. Keeping the spirit of fresh vegetables alive, a big beautiful bowl of spinach leaves with garlic-sauteed shrimp was then set before us, otherwise known as Gambas al Ajillo (recipe to follow). A traditional Spanish fish soup made with the head and bones of hake then warmed our senses. Added to it was sauteed onion, short noodles, and a small amount of emulsified mayonnaise for creaminess. The head and bones of the aforementioned hake were then followed by the rest of its body, sauteed skin side down, salted, and covered with a saffron cream sauce. And then it was devoured. This round: a red from Castilla with a mere eight months of age called 2011 Recoletas Roble. It was a Tempranillo from the Ribera del Duero estate. Once again, the perfect tart and tannin-rich accompaniment for the forthcoming food had been chosen (and yes, more food came...). The fourteenth muse, called cocido, was in Francisco's opinion the "national recipe of Spain." Made with chickpeas, vegetables, and meat, ours included green beans, carrot, potato, pumpkin, various stewed Iberian meats, and a finish of chopped spring onion and a sherry vinegar splash. As my one negative critique for the night, I'll say that this was the least-inspiring dish. The bland vegetables, unbolstered by a similarly boring broth, reminded me too much of what one would find bagged in the frozen foods aisle. Our cocido madrileño, my least-favorite dish of the night due to the boring vegetables and lack of real flavor oomph. I quickly recovered with the help of another legume, the [highly superior] Spanish version of pork and beans: habas con jamón, or warmed baby fava (broad) beans and garlic served over thinly-sliced Jamón and splashed with EVOO. Why doesn't America do more with the beautiful fava bean ? Fact: Baby fava beans and ham are going to become a staple whenever in season at my house. More home-style food ensued with moist chunks of chicken in a broth of garlic, parsley, bay leaf, and Manzanilla Sherry served over mashed potatoes. Then, at stage 18, more salad. A traditional style one finds in Southern Spain, a quartered lettuce head served in this case with a dressing of balsamic, garlic, and salt. I'm slowly becoming more of a fan of end-of-the-meal salads, as it's great for cleansing the palate and readying one for dessert. And yes, there is still dessert to come in this meal of a lifetime. If you happen to be saying something along the lines of, "What is wrong with these people? How can they STILL be eating??" I fully understand your feelings, but I don't have an answer for you. From bottom right: a sheep's cheese soaked in EVOO, a dried sheep's cheese, manchego, and a semi-aged goat cheese served with a caramelized onion and raisin jam. All but the Manchego were from the Granada region. Cheese, of course. Manchego plus three more, all from Granada. It'll be hard to replicate this exactly, but you'll have a pretty good shot with this Spanish cheese assortment (Manchego, Mahon Reserva, Idiazabal and Murcia al Vino). A Pedro Ximenez sherry accompanied. The smooth and inescapable flavor of raisins resonated surprisingly well with the cheeses, and unforgettably with the sweets to follow. For example, how about a baked sweet potato cream with sugar and rum (Ron Moddero), topped with EVOO and vanilla? AND FINALLY, number TWENTY-ONE: What other than an assortment of the so-very-Spanish turrón , a confection typically made of honey, sugar, egg white, nuts, and whatever other flavors seem yummy. This time, we found represented the delectable flavors of chocolate, vanilla, custard, lemon, and marzipan. Twenty one dishes (for the sake of weary eyes, I neglected to mention a couple minor dishes) for 38 euros and a stomach that, while full, was nowhere near the heavy-laden feeling one gets after eating a full meat-and-three dinner. This riddle I can only attribute to the will of the food gods, benignly allowing us to enjoy the end result of such amazing food without slipping into an immediate coma. The catch to this dinner was it's integrity. There were no foams, no fancy designs, no complex sauces. This was amazing food at its simplest, something that many restaurants have left behind in pursuit of something more rootless, more shocking, and often much less inspiring. Francisco understands that at its base, the experience of eating should simply be one that makes people feel good. I will leave Spain with a confirmed knowledge that one can hold on to basic culinary tradition without any snobbery or pretension and still cause diners to leave utterly happy and fulfilled. Eric, Linzee (John's brother-in-law and sister), Francisco, and yours truly, having to support each other due to our near-inability to stand after all that food. All fulfillment aside, if I'm worn out just from typing about all this, you can imagine how I felt after eating it all. Tired. Blissfully, satisfyingly tired. And ready to relive it all in the world of dreams. If you don't see yourself in Granada anytime soon, placate yourself with these cheeses in your very home , this pricey but delicious Spanish food basket assortment , or, you know, cook it yourself. I recommend Cúrate: Authentic Spanish Food from an American Kitchen . Stay with me as we head off next to the high town of Ronda! Have You Had a Nun's Bun?